The Dutch Minister for Foreign Trade and Development Cooperation Ms. Sigrid Kaag paid two day visit to Hanoi and Ho Chi Minh City from February 6-7, 2018..
Vietnam was selected as the destination for her first trade mission since her appointment as Minister, which shows the importance the Government of the Netherlands places on its relations with Vietnam. At a Holland Trade Reception, Minister Kaag and Vice-Minister Bui Thanh Son launched the celebrations of the 45 years diplomatic relations, and unveiled the logo for this occasion. Vietnam and the Netherlands established diplomatic relations in 1973, followed by four decades of tireless efforts to strengthen the relationship as development partners. The Dutch government supported Vietnam with issues such as water management, women economic empowerment, sanitation, health care, labor conditions in the garment sector, and nature preservation. When Vietnam reached its middle-income country status in 2010, our relations entered a new phase of deeper equal economic cooperation. With the two Strategic Partnership Agreements on agriculture and on water & climate change, the two countries continue to work alongside towards sustainability. 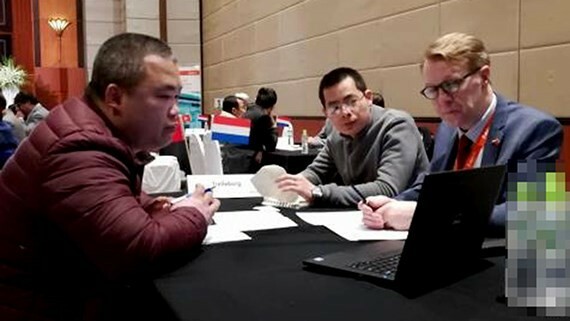 The Netherlands is now not only the second biggest EU trading partner, but also the number one EU investor in Vietnam with more than US$ 8 billion of registered investment. The Minister led a delegation with the participant of Dutch companies (45 companies of different sectors) to Vietnam. The delegation was most interested in cooperation opportunities in water management, agriculture, maritime, aviation, logistics, smart cities, and energy. Various meetings took place within just two days, both at governmental level and working level.